One of the most frequently invoked descriptions of the essence of hell is that it is separation from God. It is the eternal misery that inevitably results when a person made in the image of God is cut off the very source of joy, the eternal fountain of truth, beauty and goodness. But is this an accurate account of hell? The answer, I think, is both yes and no. To see why, let us reflect on the fact that Revelation 14:9-11 pictures the suffering of the damned as taking place “in the presence of the holy angels and in the presence of the Lamb” (14:10). What does this mean? And how should we understand this portrayal in relation to the idea that hell is isolation from the presence of God? In short, the question is how the suffering of hell can take place in the presence of Christ if the essence of hell is being separated from God. Isn’t this contradictory? Well, in response to this, I’d start with the observation of the Psalmist that there is no place where we can successfully flee from God’s presence (Psalm 139:7ff). The God of love is everywhere, and we cannot exist a millisecond without his sustaining grace and power. Paul makes a similar point in his sermon at Mars Hill, where he reminds his listeners that God is “not far from each one of us. For in him we live, and move and have our being” (Acts 17:27-28). This latter text is particularly relevant, for Paul is applying this point to people who may be seeking God, but have not yet found him. The point here, then, is that even people who may be “far” from God in terms of a meaningful, loving relationship are still “close” to him in the sense that he continually sustains them in existence. So the unhappy creatures described in Revelation 14 are in the presence of the Lamb by virtue of the fact that he sustains them in existence, and they may even be aware of this fact. However, they are utterly separated from him by their sinful rebellion. They are close in terms of something like proximity, but far apart in terms of mutual love and intimacy. As the song puts it, “so close, and yet so far away.” That is the misery paradox. It is easy to see how this uneasy situation causes misery. Imagine a son, alienated from his father who deeply loves him. He hates his father and resents the fact that he is dependent upon him, so he will not return his love, but is forced by unhappy circumstances to live under the same roof with him. The misery in his case would be palpable. Indeed, the paradoxical nature of this observation may illumine why fire is used as an image of the torments of hell. Fire in the Bible is a common image for the presence of God, not his absence (cf Deut. 4:24; 5:24-5; Psalm 50:3; Hebrews 12:29). But his presence is experienced very differently by those who are rightly related to him, as opposed to those who are not. Theologian David Hart has noted that there is a long theological tradition, particularly in Eastern Orthodoxy, that “makes no distinction, essentially, between the fire of hell and the light of God’s glory, and that interprets damnation as the soul’s resistance to the beauty of God’s glory, its refusal to open itself before the divine love, which causes divine love to seem an exterior chastisement.”[i] Our freedom to reject the love of God makes possible this perverse refusal to open ourselves to the happiness He wants to give us. Again, our freedom allows us to refuse his love and go our own way, even as it remains true that “in him we live and move and have our being.” If that is our choice, his glorious love will be experienced like a burning fire rather than “the spring of the water of life” that will deeply quench our thirst. So as crazy and paradoxical as it is, we can choose the fire. But I strongly recommend the water. [i] David Hart, The Beauty of the Infinite: The Aesthetics of Christian Truth (Grand Rapids: Eerdmans, 2003), 399. [ii] Personal correspondence with the author, in an email, January 18, 2014. Mulholland made this observation in response to my asking whether the spring of life and the fire of hell might be contrasted as I have suggested. See also Mulholland’s discussion of Revelation 14 in his commentary on Revelation in the Cornerstone Biblical Commentary (Wheaton, IL: Tyndale House Publishers, 2011). « How Reliable is our Present New Testament Text? This makes perfect sense! I believe it was Peter Kreeft who suggested that people are, in a sense, happy in hell. That is, they wanted to have their own way, and their wish was granted. 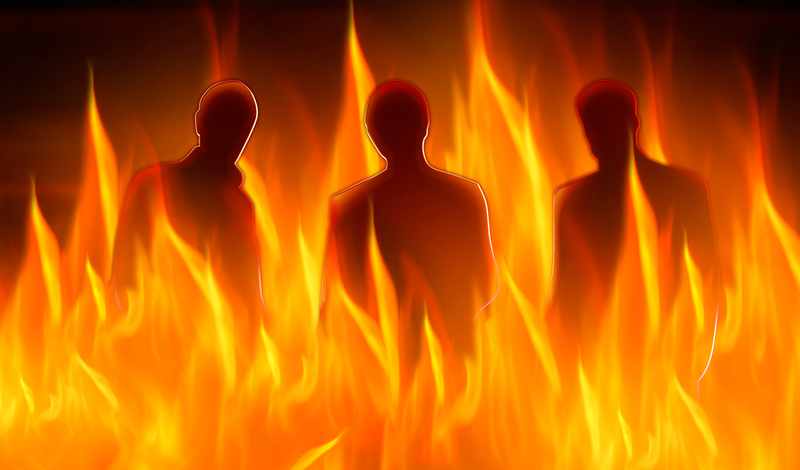 In my last post I had illustrated the matter of God’s presence in Hell. Dr. Jerry Walls from HBU has recently shared his thoughts on the matter. It would seem that the “consuming fire” is the release unto glorification on the one hand and unto annihilation on the other – in a spiritual sense on both parts. It is for refinement in the former and destruction in the latter. I find the parallel of being drunk with the wine of Babylon vs. the ‘mixed/unmixed’, i.e., undeluded wine of God’s wrath poured into the cup of God’s anger, precludes masking God’s positive judicial judgment with that of his love. Hence the long tradition, mostly within Eastern Orthodoxy, is wrong. My husband and I recently held a similar conversation, after reading the chapter on The Consuming Fire from George MacDonald’s Unspoken Sermons. It begins to appear that “hell” is not so much a place to “punish sin,” as a place to heal and cure man of his malaise, those things that are taking him away from the whole (that perfect)man he is meant to be. And if God is a loving Father, concerned with the well being of his children (are not all created by Him?) then it would be most natural that God “hell” would not only not be removed from God, but in His presence, as like you said, everything is. And perhaps even more as well- here’s a small excerpt, but the whole chapter is excellent on this subject. I wanted to share this as a part of the series on paradox in Christian thought. Well done, Dr. Walls. How can your statement that “Revelation 14:9-11 pictures the suffering of the damned as taking place ‘in the presence of the holy angels and in the presence of the Lamb’” be true at the same time as Revelation 21:3-4? How is it true that there is no mourning or crying or pain in the presence of God while there is also suffering and torment day and night in the presence of God? That is the paradox of your position.